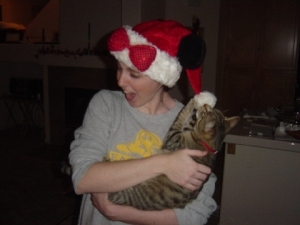 Everyone has her own holiday traditions. 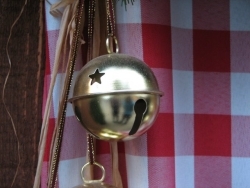 Be it mistletoe or eggnog or caroling between houses dripping with Christmas lights, each of us has our favorite. And I'm no exception. Halloween may fall in my favorite month of the year, and it may mean that I can dress up as a fictional character and eat my body weight in candy, but it's a single day. Christmas, as Kris Kringle says in Miracle On 34th Street , 'isn't just a day. It's a frame of mind.' An entire season is dedicated to the giving of gifts, the decking of halls, and the good willing of men. Up goes the tree sparkling with lights. Christmas tunes float from the speakers and a fire roars on the hearth (which is only a 'hearth' at Christmastime. The rest of the year, it's a fireplace). This year we three kids and our significant others took to decorating the tree, and it was over in a flash! Every silly, shoddy little ornament we'd made since the second grade found its rightful place among the red and gold bulbs we use as fillers, and with each carefully considered placement came a story. It was like suspending memories from the branches. The season that began for me on the Friday after Thanksgiving, with the annual Ya-Yas in San Francisco trip, will not be over until the New Year rings in. Somehow I've managed to come up with a zillion little traditions to cram into 5 weeks. It's a compilation of the traditions of my childhood, the traditions of Jonathan's childhood, and a few we've made up on our own. We have our annual Christmas Disneyland trip, which won't shock anyone. While there we'll buy a new Disney ornament for our tree. We have one from each past trip. This weekend we'll buy our tree, and I'll wait patiently as Jon takes seven hours to string the lights just-so before we can decorate it. We watch the traditional Christmas movies: It's A Wonderful Life , A Christmas Story , Rudolph the Red-Nosed Reindeer and White Christmas . Then there are a few movies I think of as traditional to Christmas, but few outside my own family have heard of: Holiday Inn (where Bing Crosby first sang Berlin's White Christmas ), Christmas in Connecticut , etc. And If I feel like fiddling whilst watching these nostalgic films, I'll press whole cloves into the bright red skin of an apple, or string popcorn on thread to add to our tree. Each year I develop an advent calendar for Jon, with little presents for him to open every other day or so throughout the month. I place these tiny gifts under a little tree we keep in the kitchen. My mom always did great advent calendars for my brothers and me. Thankfully, it turns out the skill is hereditary. And it doesn't hurt that I get to decorate another tree. At some point we'll hang our stockings. We've had them since we were little, but they've held up nicely. Of course, Disney and Crypto each have their own. They still believe in Santa ; isn't that cute? 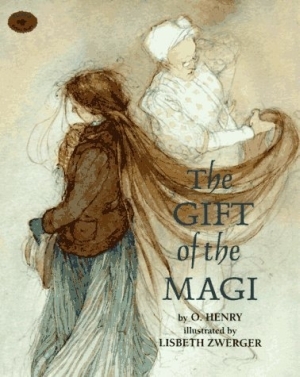 But one of my favorite holiday musts is to snuggle up with my husband and read The Gift of the Magi aloud to him. It's my favorite short story of all time. Written by O. Henry, it is the Christmas story of a very young couple at the turn of the century who learn an important lesson about sacrifice, but who ultimately teach the reader an even more important lesson about love and generosity. I've decided to include this story word for word here, so that everyone has a chance to enjoy it. Please read in the spirit of Christmas, remembering all the while that special person for whom you would sacrifice absolutely anything. Pam Houston's "A Little More About Me"